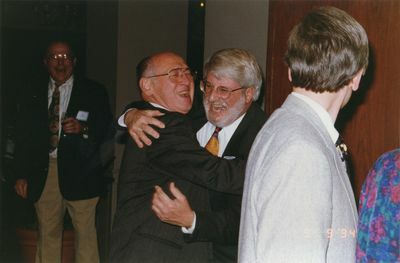 Phillip DeVito gets a congratulatory hug from friend and winemaker David Adelsheim during DeVito's retirement celebration at the Benson Hotel in Portland, Oregon. DeVito was the maître d’hôtel and cellar master for the fine dining and wine program at Salishan Lodge in Gleneden Beach, Oregon, for 22 years. Phillip DeVito Collection. Jereld R. Nicholson Library, Linfield College, McMinnville, Oregon. Donated by Janice DeVito, 2013. Unknown, "Phillip DeVito and David Adelsheim" (1994). Phillip DeVito Historical Photos. Image. Submission 9.